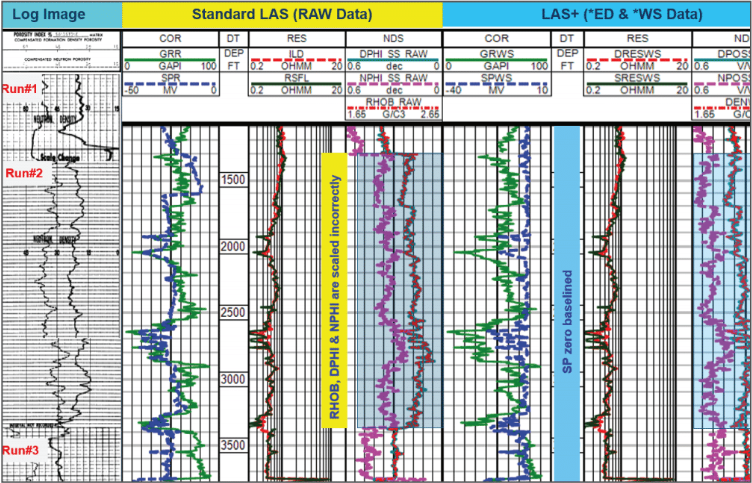 The LAS Plus log curve set provides the best open hole curve data available for a given well, depth shifted geologically valid curve data that has been edited to remove sections of data adversely affected by drilling or logging (e.g. tool failures, computer glitches, tool pulls, logging drum magnetization). Petrophysicists, Geologists and Geophysicists can work confidently with LAS Plus processed curve data that has been quality controlled by our specialists, who have strong backgrounds in geoscience, well logging, and data management. The entire wellbore system is validated to ensure accuracy of the well information provided such as API/UWI number, original operator, well name and well number. The following is provided with the qualifiers: locations, elevations, depths, dates. An H-diagram of the well system is provided for each licensed LAS plus. A standard LAS Plus curve suite will consist of all available gamma ray, spontaneous potential, caliper, resistivity, conductivity, sonic, density, density correction, neutron, tension and rate of penetration curves. SP mechanical shifts will be removed along with SP drift, and the shale baseline will be adjusted to 0 MV. Original curve mnemonics will be modified to differentiate between the same curves from different logging tool. For example: A Gamma Ray (GR) from Density Log would be named GRD, from the LWD log GRWD if the Gamma Ray doesn't have a mnemonic in the log, or from the SONIC log GRS. Using the edited curves, bearing the original logging contractor mnemonics with the “ED” suffix, key curve types are identified, merged if necessary and given generic well log curve mnemonics with a “WS” suffix to ease identification. Like curves from multiple run/logs are merged to provide a single curve with maximum depth coverage. For example, a GRWDED covering the shallower portion of a well would be merged with a GRDED covering the deeper portion of the well. The resultant curve would be called GRWS. Key curve types from the “ED” curves are duplicated and renamed with generic mnemonic. The curve descriptions are added to each curve under the Curve Information section in the LAS Plus header. The standardized TGS generic WS mnemonics can simplify the workstation environment by allowing the interpreter to use one template, minimizing the complexity associated with multiple logging contractors' mnemonics. 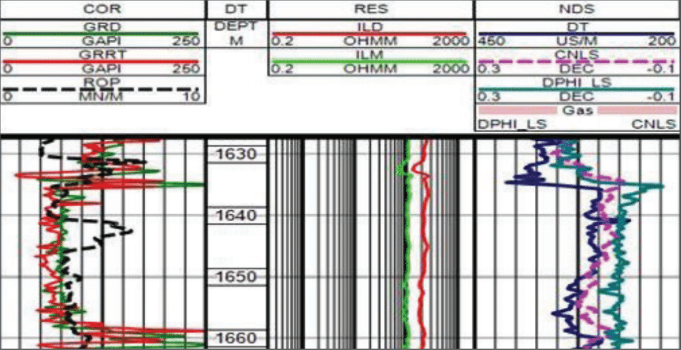 TGS has the largest library of immediately available processed well logs in the industry, workstation-ready for correlation, mapping, petrophysical evaluation, and complex integrated analysis. Need complete-curve LAS? TGS digitizes 12-curve suites to provide the best data to customers and continues to add to the online database.